High-efficiency Tarm wood gasification boilers are easy to start, smokeless, and can reduce your heating bill by 75% or more. If you have access to abundant cord wood, heating your home with a cord wood boiler has never been more efficient, clean or easy. Cord wood is a renewable, cleaner-burning fuel source that reduces your carbon emissions by up to 90%. You may be heating with cord wood already and are considering an upgrade to your boiler. True North installs Tarm wood-fired gasification boilers, which offer unusually high heating efficiency, low heating costs and the use of an abundant, locally available, renewable fuel. The wood gasification combustion technology found in Tarm boilers is the most efficient way to burn cord wood. 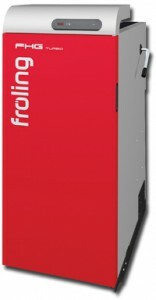 As a result, Tarm boilers use substantially less wood than conventional wood boilers and outdoor wood water stoves. Additionally, this high-efficiency burn technology produces little or no creosote, virtually eliminating the risk of chimney fires and greatly reducing greenhouse gas emissions. A cord wood fired gasification boiler works with your home’s existing heat infrastructure to provide a whole-house heating solution. Firewood burns most efficiently and cleanly when it is burned hot and fast. Tarm boilers offer down-draft gasification, which facilitates this kind of burn. Your home, however, does not heat in this same way; it calls for heat only as needed. In order to meet both of these demands, we recommend combining any wood boiler with a water storage tank of 500 to 1000 gallons. By using this type of thermal storage your wood boiler can always burn hot and fast – even if your home is not calling for heat – and you will have access to the heat the boiler produces throughout the day. Thermal storage allows your wood gasification boiler to burn at maximum efficiency. The excess heat is stored in a water tank for later use. If you only plan to use your wood boiler during the winter months, thermal storage is not necessary. True North will work with you to determine the best plan for your home. Tarm cord wood boilers achieve the cleanest burn in the industry by using a double burn. When you start your boiler, the wood gasification combustion process begins by pulling fresh air into your boiler to fuel combustion. This primary combustion produces a hot mixture of unburned gases that are then pulled down into a secondary combustion chamber where they are mixed with pre-heated air, resulting in a very hot 1800 to 2000 F secondary burn. Only at these high temperatures can a high-efficiency, clean burn be achieved. It is very easy to start your fire in a Tarm cord wood boiler via its large front-loading fire box. In addition, when adding wood to an established fire, a smoke extractor ensures that any smoke that attempts to roll out of the loading door is pulled into your chimney, preventing smoke from entering your home. As with any solid fuel burning appliance, ash must be removed periodically from your Tarm wood boiler. The bulk of the ash builds up just inside the bottom door of the boiler and can easily be removed. A second, side-mountable rear ash removal door makes fly ash that builds up in the back of the boiler easy to remove, a feature unique to Tarm cord wood boilers. A Tarm cord wood boiler is built to last. Tarm boilers are made from fully welded 6mm thick steel with additional 3mm steel firebox aprons. Tarm boilers are constructed to European boiler design standard EN 303-5 and are to be used in pressurized systems. Tarm boilers are UL and ULC approved. Read more about Cord Wood Boilers or get started today!